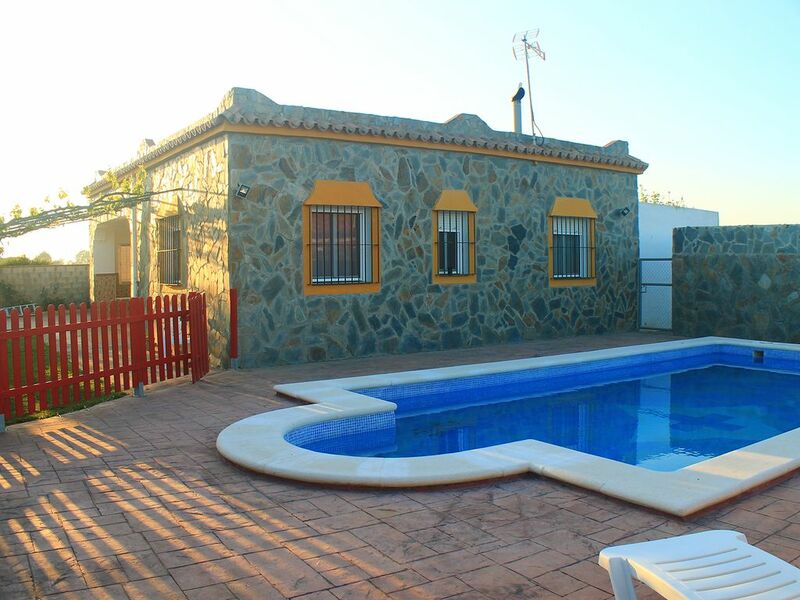 Holiday rental in Conil de la Frontera of a spacious house with private pool, which is fenced for greater security with small children. There is also a barbecue area opposite the pool. The property consists of three bedrooms, the main one has a double bed, the second has two singles and the third, one single. The lounge-diner is roomy and there is a fully equipped kitchen with an American bar. There is one bathroom. In the exterior there is an attractive porch covered with grapevines, which give natural shade, and in the garden there are flowers, lending a natural charm to this property. Exterior furniture consists of table and chairs and sun loungers where you can sunbathe and pass the hours away. This property is located less than 10 minutes away by car from the beaches and coves of Roche, and the same time from the town of Conil de la Frontera, and two kilometres from the motorway. There is a commercial area just five minutes´ drive away where you will find restaurants, tapas bars, a chemist, fishmonger, bakery and supermarket.